CLICK HERE to see wait list time frame. ​Costs are per lineal foot per month plus 12.84% leasehold tax. Overhang shall be pro-rated. Any portion of a foot shall be considered a full foot. 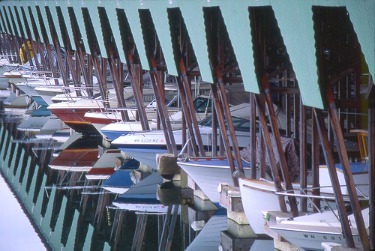 Permanent moorage rates below are all on month-to-month basis with a minimum of a 2 month lease. ​** Seasonal monthly rates apply to 20', 24', and 28' open or covered moorage during the period of March 1st to October 31st. If the tenant stays beyond this season, the rate will lower to the permanent monthly rate. $225.00 per month plus 12.84% leasehold tax. The rental fee for an inside storage rack for one kayak is $20.00 per month plus 12.84% leasehold tax. Option to lock kayak to rack is available, tenants provide their own lock and cord. Locker storage for oars is available for an extra $5 per month, must provide your own lock. Vehicles and trailers that are in violation of Marina parking rules may be impounded at owners expense. COVERED 20 9' 4" 12' 9"
24 10' 5" 12' 9"
28 11' 10" 12' 9"
32 12' 7" 13' 8"
36 14' 6" 13' 8"
40 16' 8" 13' 10"
50 16' 10" 16' 10"
Dry Shed 25 8' 11" 9' 0"
Storage Loockers 4'0" 2' 10" 9' 0"